It's fair to say that just about everybody has something that he or she needs to let go of. Many of us keep it bottled up inside, where it can do great harm to our psyche, eroding our soul from the inside out. Over the eons, Buddhists in what was formerly the Northern Thai kingdom of Lanna came up with a way for the people to both honor the Lord Buddha and to release all the fears, negative feelings and suffering that lay within them. By either lighting a paper lantern or a candle on a floating raft called a krathong, the people of Thailand let go of all that has been weighing them down spiritually on the full moon that falls within the 12th month of the Thai calendar. While each Buddhist country in Southeast Asia celebrates this joyous holiday in some capacity, the most visually spectacular observance of this sacred day takes place in the city of its origin, Chiang Mai. While it is referred to as Loy Krathong throughout the rest of Thailand (occasionally you will hear this name in Chiang Mai as well), in the north of the country, it is referred to as Yi Peng, and it is marked by the mass release of lanterns by families, their friends, and many travelers looking to join in on the fun. The traditions from which Yi Peng/Loy Krathong was derived come from Brahmanic origins in the religion of Hinduism, Buddhists in Thailand, at the urging of King Rama IV, co-opted the use of lights and lanterns from this faith as a way of honoring the Lord Buddha, as well as a way for the people to release the suffering that they had been holding within themselves over the previous year. While those in the central and southern parts of the nation have only adopted this practice over the past 150 years, those residing in the kingdom of Lanna (Northern Thailand) had already been hoisting rice paper lanterns for a similar purpose since the 13th century, making Chiang Mai the perfect place to experience this world-famous Thai celebration. Today, Yi Peng is a photographer's dream come true, as the opportunities for killer photos are numerous through the course of this festival. Around the moat that encircles Chiang Mai, elaborately constructed lanterns in the shape of dragons, lotuses, and other designs can be found on temple grounds and at each of the gates that permit access to the Old City. Fireworks light up the sky with increasing intensity as the climax of Yi Peng approaches, and the biggest event for shutterbugs by far is the mass release of lanterns that takes place at Mae Jo University. 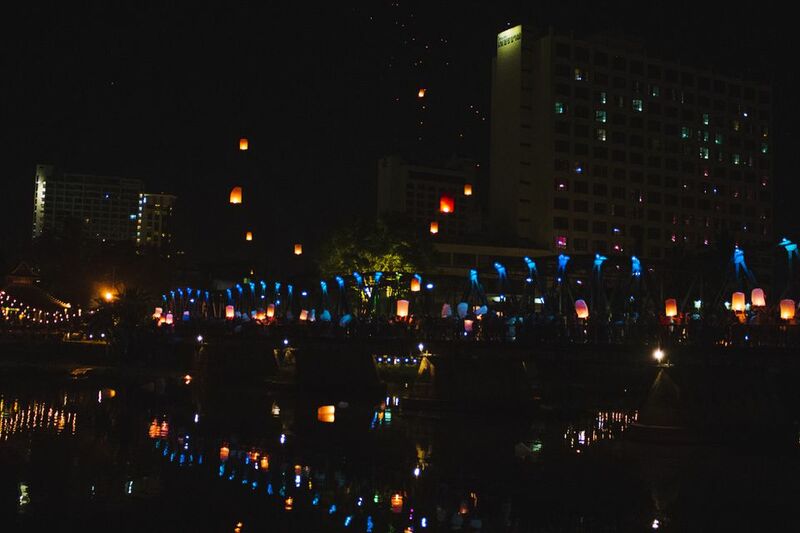 Thousands of lanterns fill the sky all at once, which is an event so intense in its scale that air traffic controllers sometimes restrict access to the airspace around Chiang Mai during the course of this event. Yi Peng in Chiang Mai falls on the full moon within the 12th month of the Thai calendar, which usually means the event takes place between late October and November. usually around the full moon, though the date is typically released only a month or so prior, so flexible travel plans are essential for those planning to attend. Lantern releases, viewing paper sculptures around the moat and at the temples, and other events related to this holiday take place during the week leading up to the big day, so don't worry about having fit everything in within the course of a couple of days. Yi Peng is a holiday of reflection for many Thais, so keep this in mind when attending festivities by not imbibing alcoholic beverages in excess. In order to release your very own lantern at the organized event at Mae Jo University, purchase one from vendors inside of the event - not from those selling lanterns outside, as they are not allowed. Use one of the flickering torches to light the lantern and allow it to build heat before releasing. This will allow the hot gases to build up within the lantern, allowing it to float away into the sky with nary a problem. Pay special attention to where you release your lantern, as they have a nasty habit of getting tangled up in trees and power lines. Those who wish to attend the mass release at Mae Jo University will need to grab a green songthaew from Warorot market in Chinatown. This public transit vehicle will take you 16 kilometers outside the city to the university grounds, and it should only cost you 20 baht, though many enterprising drivers will try to quote you a much higher price.